I’m grateful to friends for helping me find my crafty voice. 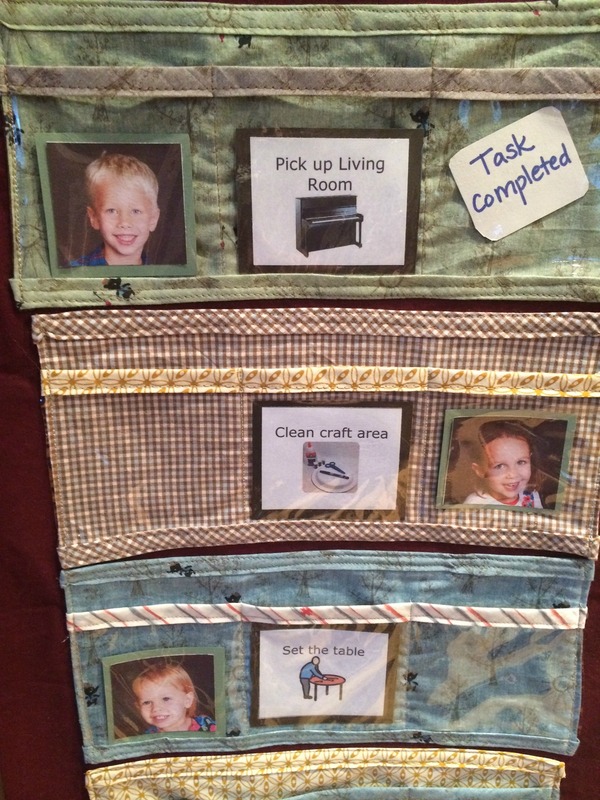 Take this family chore chart, a design collaboration with my coworker-turned-friend Kate. Last year, when I sought sympathetic testers for custom sewing projects, she approached me with this idea. Kate made kid-friendly cards. When enough tasks move to the completed column, that child gets to “shop” for something in the family store. That weekend I was heading to my childhood hometown of Austin, Texas. “How’d you like an excuse to visit your favorite fabric store when I’m in town?” I asked Amy, a crafting mama I’ve been friends with since 5th grade. I think you can guess her answer. My first homemade bias tape! While there, we discovered this bear pattern, which came in green, brown, and blue. I bought all three. Of course, though, I had to mix it up. For the pocket borders I wanted fabrics that weren’t obvious but complemented the design. The modern, mustardy-yellow pattern would add sophistication to the childlike bears. Vinyl fabric makes up the pockets. How cute is this little fishing guy by the trees? The chart in its home! The biggest challenges were learning to make bias tape and working with vinyl “fabric.” Overall, though, I’m pleased with how it turned out. What’s a DIY home project you’ve been browsing? This isn’t a bag I’d make for just anyone. It’s fearless, and it’s one of my favorite projects ever. It was a custom job for a particularly hip girlfriend of mine. Last year she accompanied a group of teen designers on a trip to Jerusalem as part of the powerful and innovative Design Diaries International museum-exchange program. So I was thrilled when she agreed to be a bag tester for me. I’ve been dreaming of expanding my crafting hobby into some sort of side gig of by own, and she signed right up to help me out. The plan: She’d give me design parameters, I’d make a bag for her at cost, and she’d give me feedback. 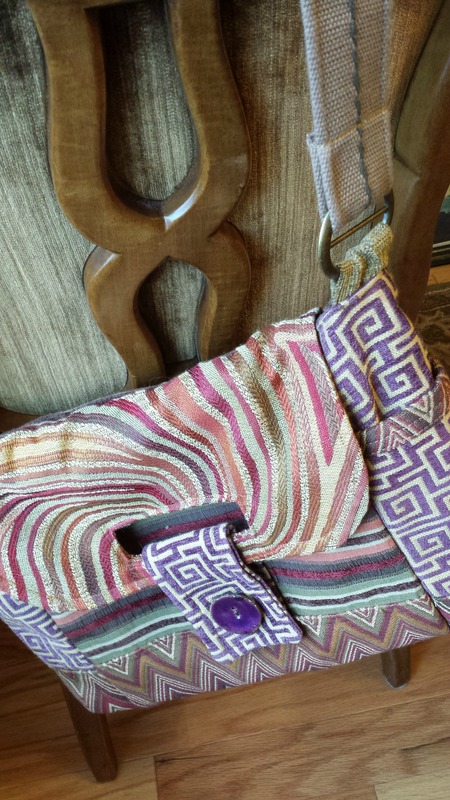 Her wish list: a) incorporate her fave color purple, b) lots of pockets, c) a 60’s vibe, and d) a mix of patterns that look like they don’t go together but end up working. This final request made me want to do the happy dance. I love working with upholstery fabrics, so I hit the rolls at my local fabric store. And here’s the result. What’s on your bag wish list?